Click on + show block where it appears under the name of any of the men to discover more about him. Reuben Headlam Dobson was born in 1885 in Stokesley. He was the son of George Dobson, a bricklayer from Redcar, and Eliza Jane (nee Headlam) from Whitby, who had married 1872 in Guisborough. George Laverick (Reuben's father) died in 1906, and the 1911 census records Reuben living with his mother (now a widow) on Stokesley High Street. Reuben's occupation is 'builder' and his mother is 'assisting in business'. Two of Reuben's sisters and his brother completed the household. Reuben attested for war service in Stokesley on 30th November 1915. He was then 30 years and 7 months old and his occupation was recorded - rather oddly - as 'butcher'. (This is probably a mistake as he later received proficiency pay as a plasterer). Reuben was just over 5'4" in height and had a 44" chest. He listed his mother as next of kin. Reuben joined the Royal Engineers as Sapper 185163. The following day he was posted to the army reserve and posted as Sapper in August 1916, with a proficiency qualification as a plasterer. Prior to this move, he had to undergo a second medical examination. It seems Reuben had changed rather - his chest measurement was now 41" and his height was 5' 5". His weight was 170lbs and he was stated to be of good physical development apart from problems with his teeth. Reuben remained in the UK for a while, and once ran foul of the authorities for overstaying a pass from Conway Camp. He arrived back an hour and fifteen minutes late. For this trivial offence, he received three days close confinement! On 1st April 1917, Sapper Dobson embarked for France to join the BEF as part of 458th Field Company, Royal Engineers. Whilst serving with this unit he was wounded - on 8th September 1917. Reuben recovered and went back into service. In early 1918 he was granted 14 days leave and returned to duty only to suffer another wound - on 14th April 1918. He was admitted to hospital for a few days and discharged again on 19th. Evidently, however, he was not fit enough to return to the field, as it was only on 1st May that he was posted back to 456th Field Company. Reuben remained in France until after the Armistice, and we next find him being granted 14 days home leave on 21st January, 1919. He was then transferred to 459th Field Company and served in Germany until he was demobilised on 4th October 1919, returning to the family home in High Street Stokesley with an A1 medical rating! 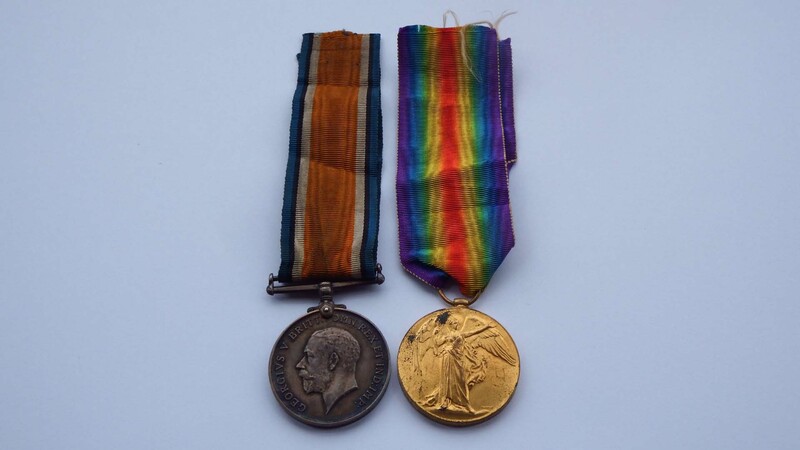 Sapper Headlam Dobson was awarded the British War Medal and the Victory Medal, which we are delighted to be able to show here by courtesy of our web friend Adam Harland, proprietor of Harland's Military Antiques (http://http://www.harlandmilitaryantiques.com/). Adam has provided us with several pictures as well as the fruits of some of his own research, for which we are extremely grateful. In 1925, it seems that Reuben married Elsie Metcalf in Stokesley, but research has not revealed any children to the marriage. Reuben Headlam Dobson died in December 1972 at 1 College Square, Stokesley. He was 87 years old. 1 One of Reuben's sisters, Alice, married James Laverick and one of his mother's cousins was James Headlam - for both of whom see elsewhere in They also served). Fred Entwistle was born in 1891 in Edgworth Lancashire, where he seems to have spent the first twenty years of his life. He was the son of Joseph Entwistle, farmer, and Dorothy Whitehead, who were married on 7th May, 1877 at St Peter's Church, Bolton-le-Moors. Fred was only two years old when his mother died, and he was raised together with eight brothers and sisters by his father. In 1901, the family were at Pleasant View Farm in Edgworth, but by 1911 they were at Slack's Farm in the same township. When Fred attested at Stokesley on 11th December 1915, he was living at Seamer Moor. He joined the Yorkshire Regiment as Private 26373. Fred was 24 years old and a stockman on a farm. He was 5'7" tall with a 38" chest and he gave his father Joseph (still at Slack's Farm) as next of kin. He was medically examined for a second time at Richmond, two months later and then weighed 138.5lbs and was of 'good physical development'. 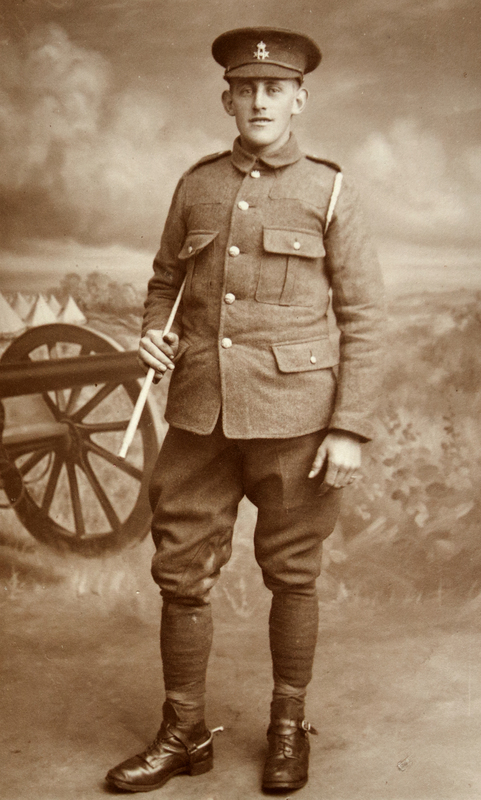 On 9th February 1916, Fred was transferred to the Machine Gun Company as Private 35214. He embarked at Folkestone on 26th July 1916 and the following day he disembarked at Boulogne and joined B Depot, Camieres. He was moved to 58th Company on 31st July. 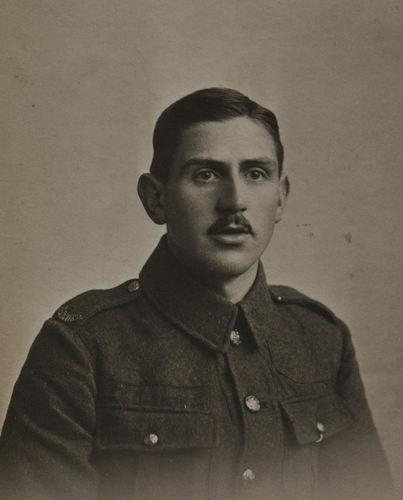 Private Entwistle spent the rest of the war in France, though over the following months he suffered from a number of minor ailments for which he spent short periods of time in hospital. In March 1918, Fred suffered a gunshot wound to the left wrist which put him in hospital. On 22nd April he was back at his base depot, but was re-admitted to hospital on 28th May with an ankle injury, apparently sustained accidentally in his billet. An official has annotated the report of this incident: "Injured soldier not to blame". He rejoined the 19th Battalion MGC on 8th June 1918. Fred Entwistle was awarded the British War Medal and the Victory Medal. Research reveals that a Fred Entwistle died in Middlesbrough in 1947 aged 56. We find all 4 brothers in the census records for 1901, living in Back Lane Stokesley with their parents George Exelby (general domestic servant) and Elizabeth. and two younger sisters, Mary and Jane. Jane (or Jennie) was then under a month old but would grow up to become the mother of our informant, Fred Stearman. By 1911, Albert was 14 and at school, like his two sisters, and living in the family home on Levenside. William, George and Joseph had all left home, and all three brothers were farm workers. Their stories, told below, show where they were living at the time of this census. Strangely, though, their father George also recorded them in his own household, George senior was working as a grocer's 'rolleyman' - rolleys being the equivalent of today's trucks. Albert joined the Territorials on 1st April, 1914 (before the outbreak of war). He gave his age as 17 years - an untruth as he would not reach this age until the following month! Perhaps the recruiting officer could not be blamed for his mistake in accepting Albert's word, as Albert was a strapping lad, especially for the times! His medical examination tells us that he was 5'10.5'' tall with a 36" chest, good physical development and good vision. As a young soldier, Albert was not immediately sent abroad when war broke out. He spent two years in the 4th Yorkshire (Reserve) Battalion, before being transferred to the 3rd Border Regiment as Private 241769 on 4th July, 1916, and was sent to France only a week or so later on 12th July. Two days later he was transferred to the 5th Battalion. This was the time of the Somme offensive, and soldiers were constantly seeing action. On 19th September, Albert received a gunshot wound to his left arm which was serious enough for him to be sent back to England and there he remained until sent back to France in the following December. Whilst at home, Albert was for a time a patient in the VAD hospital in Stokesley Manor House. Albert was wounded on three further occasions , in April 1917, in October 1917 and in May, 1918. Nonetheless, he survived to tell the tale. He was officially demobilised in February 1919. He received an enhancement of 20% to his pension on account of a disability caused by a gunshot wound to the left thigh. This brought his total pension to 8 shillings and threepence per week. Private Exelby was awarded the British War Medal and the Victory Medal. He was still only 21 years old. Beatrice, born 31st August 1923 and Margaret born 19th November, 1929. Albert Exelby died in Middlesbrough in 1950. George Exelby was one of four brothers who served in the Great War. Their father was George Exelby, the adopted son of William Exelby, a brewer's labourer who became landlord of the Black Horse Inn in Stokesley. William had been born in Askham Bryan in 1838 and his wife Mary Pacy was from Skipton. We first find this couple in Stokesley in the 1871 census, with their 2 year old adopted son, (George's father) known then as George Hugill. George junior seems to have left home by 1911, when we find him recorded in the census living at the house of his employer Christopher Hutchinson. Christopher Hutchinson was a farmer at Nunstainton Grange, Ferryhill in County Durham and he recorded George as a 'horseman on farm', a very responsible job in the days when the whole of agriculture revolved around the 'heavy horse'. Oddly, George's father, George senior, recorded his son as still living at home in Stokesley! (See under Albert Exelby above). 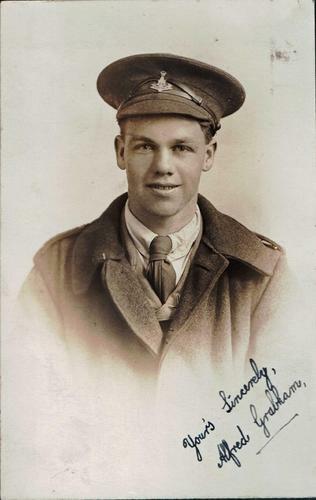 Fred Stearman possesses photographs of his uncle George showing him in uniform, but unfortunately George's army record seems to have been totally lost. There is hardly a clue as to where he served apart from a memory of Fred's mother Jane (nee Exelby) - see above - that he was part of a regiment which was styled Princess Alexandra of Wales' Own. Normally this would mean the Yorkshire Regiment but there is absolutely no record of a George Exelby in its ranks. To this apparent mystery, we are pleased to be able to give Fred Stearman's own explanation. 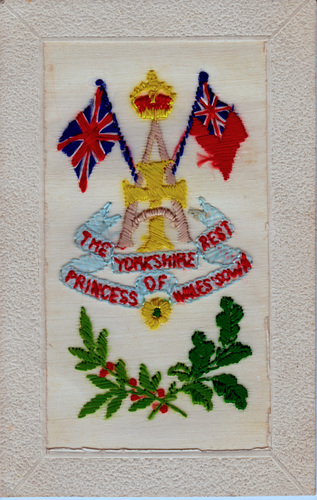 He has supplied us with photos (shown below) of a beautifully embroidered postcard sent from the trenches to Fred's mother Jane (Jennie). It is clearly from her bro(ther) George, and equally clearly the picture on the face of the card shows the badge of the Yorkshire Regiment. 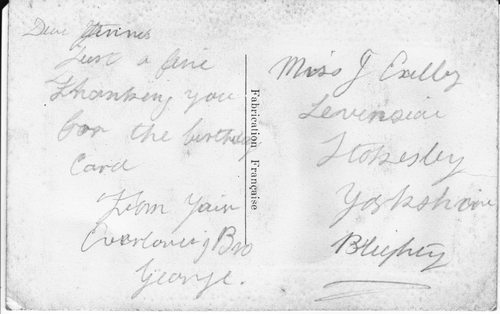 It is obvious from the back of the card that it was of French manufacture, and we can presume that it was something of an industry to produce such articles for the 'Tommies'. Fred is of the opinion that George was unable to find an embroidered card showing the badge of the Twentieth Hussars, and therefore sent this particular picture as he thought it to be the best available option for sending to his young sister in Stokesley. The resulting confusion is easy to understand! There is however a Medal Roll reference to a George Exelby in the 20th Hussars, which almost certainly refers to 'our' George. The photograph of George appears to clinch the matter, as it clearly shows him wearing jodphurs-style trousers and spurs. His cap badge is also clearly visible, and it is that of the 20th Hussars. The X to each side of the letter H (for Hussars) on the badge is the equivalent of 20 in Roman numerals. If the identification is correct, George Exelby was Private 28933 in this regiment, and was awarded the British War Medal and the Victory Medal. (He quite possibly joined up after he was married, as there seems to be no entitlement to the 1915 Star). Although we are informed that the 4 children of George's marriage are no longer living, there do remain living descendants of George and Naomi; Stokesley folk may remember the Radio and TV shop which this branch of the family used to run in the town. In 1911, Joseph, aged 15, was a farm boy working for John Metcalfe of North Tanton, who recorded Joseph's surname as Exxaby! Strangely, Joseph's father George senior also entered his son into the census as living with him on Levenside in Stokesley! We do not know when Joseph joined the army or where as the records have not survived, but there are two Joseph Exelby entries in the Medal Rolls for the Great War. Taken alone, the information given in each record is not of itself conclusive as to which is the Stokesley Joseph. One of these men was a driver and then a gunner in the Royal Field Artillery. This man fought on the Western Front and was awarded the British War Medal, the Victory Medal and the 1915 Star. The other Joseph Exelby was a Private in the West Yorkshire Regiment and later in the Army Ordinance Corps. He received the British War Medal and the Victory Medal. However, thanks to Fred Stearman, we can identify the Stokesley Joseph as the first of these men. Joseph married quite late in life, on 17th July 1930. His wife was Lily Beavis, and they seem to have had two sons and a daughter. Stanley, born 30th April, 1931 who died in 2006, a daughter born in 1933 who married and is still living in Stokesley, and a son born in 1940 who had two daughters. There are therefore descendants of Joseph still living in the area who might be able to shed more light on Joseph's life and military career! In the interests of their privacy and to protect them from identity theft, we have chosen not to give their names on this website, but we would welcome further information from them if they are able to, or wish to, provide it. William Exelby was the eldest of four brothers who served in the Great War. Their father was George Exelby, the adopted son of William Exelby, a brewer's labourer who became landlord of the Black Horse Inn in Stokesley. William had been born in Askham Bryan in 1838 and his wife Mary Pacy was from Skipton. We first find this couple in Stokesley in the 1871 census with William's father, their 2 year old adopted son known then as George Hugill. In 1911, William was 17 years old and living at Stanley House in Great Ayton and working as a farm 'servant' to Charles Rowland. As with two of his brothers, William was also entered (incorrectly) into this census by his father, George senior, as if he were resident with the rest of the family on Levenside, Stokesley. William gave his occupation as farm labourer when he attested at Stokesley on 6th January, 1915. At that time he was living on Levenside, and the records give Willam's age as 20 years and 9 months, his height as 5'9" and his weight as 136.5lb. He had a chest measurement of 37.5" and was considered as of "good physical development". He was immediately posted to the Royal Army Service Corps at Bradford and remained in England for the next 7 months. During this time he trained as a driver, and he was then posted to France, leaving Southampton for le Havre where he arrived on 1st September 1915, to serve as an ambulance driver with the 72nd Field Ambulance Corps, attached to the 24th Division. Ambulance personnel were by no means 'safe' in the war zone, but William served through to 15th April, 1919, several months after the war finished - doubtless there were many casualties to deal with and perhaps even burials to complete. During this long service, William received his Good Conduct Medal (6th January 1917). He was at home from 18th March to 15th April 1918, but apart from this seems to have served continuously on the Western Front. For his service, William received the British War Medal, the Victory Medal and the 1915 Star. After the war, William married Gladys Parker in Stokesley on 9th September, 1920. They had one daughter, Winifred, born in 1923. Winifred died without issue. William's death was registered in Newcastle upon Tyne in 1971. Robert Farrow was born in 1889 in Nunthorpe, which was then in Stokesley Registration District. In 1891 he was living with his parents at the Nunthorpe home of his grandfather, John Ellerby farmer and land agent. John's daughter Harriet Ellerby had married William Farrow, a butcher of Stokesley the previous year. Ten years later in 1901 William was an auctioneer and butcher, and living in Market Place Stokesley with his wife and three children. Robert now had two younger sisters Sarah and Jane. The whole family was still together in the High Street in 1911, and Robert, now aged 22, was recorded as a butcher's assistant. Robert attested at Stokesley in November, 1915, at the age of 26 years and 9 months. He gave his address as Market Place, Stokesley and his occupation as Butcher and Auctioneer. He was over 5'7" tall with a chest measurement of nearly 40" and gave his father as his next of kin. Robert joined the 82nd Training Battalion where he seems to have remained until 17th March 1917 when he was transferred to 1st Battalion of the Yorkshire Regiment as Private 44815. From this point until December 1919 he served in India. The records for Robert are limited in scope, but we are told that whilst in the army he gained his Third Class and Second Class Certificates of Education. He returned to England and was demobilised on 22nd January 1920, returning to his old home in Market Place. Private Farrow was awarded the British War Medal. Strangely, his records do not mention the Victory Medal to which he was also entitled. There is a marriage registered in Stokesley between a Robert Farrow and Kate Watson in the latter part of 1920, but researches have not revealed any children to the marriage. Robert died at home in The Avenue, Stokesley on the 6th November, 1956. He left over £7000 in his will. Kate had predeceased him. John Fawcett was born in Kepwick in 1895, the son of Robert Fawcett, farmer, and his wife Louisa. John’s family do not appear to have lived in the area prior to the war. According to information on www.ww1yorkshires.org.uk John grew up in the Yarm area attended the Grammar school there before becoming a pupil teacher in the local council school. The same source also states that John was living at Spring House, Great Broughton when he enlisted. John Fawcett joined the 21st KRCC as a Private but was transferred to 3rd Battalion Yorkshire Regiment and received his commission on 16th February 1918. The London Gazette Supplement dated 19th February lists amongst recent promotions: “The undermentioned from Officer Cadet Units to be 2nd Lieutenants --Yorkshire Regiment – John Fawcett”. The death rate amongst junior officers was high during the first world war. They were conspicuous and also led their men into action. Lt John Fawcett was killed in action on 8th May 1918 near Ypres. He now lies in the war cemetery at Voormezeele in enclosure 3, an area where soldiers' remains were brought for re-interment from other smaller sites after the armistice. Lt Fawcett was reburied in 1919, his body being identified by his “Disc”. He is officially recorded there as the “son of Robert and Louisa Fawcett of Lowlands Farm Yarm". Lt John Fawcett is commemorated on the Broughton and Kirby memorial and the Ingleby Greenhow Memorial. His parents are buried in the church yard at Kirby, his mother Louisa having died less than a year after her son's death and John's father in 1925. John is also mentioned on his parents' headstone. All of Albert's’s siblings were born in Stokesley, and the growth of the family can be traced in the town through census returns from 1881, when they were living in Back Lane. In 1891 they were living on South Side, near the Rectory, where they seem to have remained, being recorded in Rectory Yard in 1901 when Albert was 8. By 1911 Albert, 18 years old, had left the parental home and was working as a coal miner in Ferryhill, County Durham, but the work does not seem to have suited him, as when he attested on 11th August 1914 at Durham he gave his occupation as farmer and his mother as next of kin. Oddly, he signed up as Alfred, which was later corrected. On 13th August he joined the ASC as Driver 35688 at Bradford. Albert was 5'2" tall, weighed 140 lbs and had a chest measurement of 35.5". He had a fresh complexion, grey eyes and brown hair and was 22 years and 4 months old. Albert was 'at home' until 3rd August 1915, when he was sent to join the BEF in France. On 5th November 1917 he was transferred to the 8th Yorks and Lancs Regiment and was sent to Italy. He returned home on 6th June 1918 for two weeks, and then returned to Italy until the end of the War. On 10th August 1918, Albert was again transferred - to the 9th Battalion of the South Staffordshire Regiment as Private 43387, and it was from this regiment that he was demobilised in January 1919, medical category A1. Albert's service with the colours was not without disciplinary lapses, but he was awarded the British War Medal, the Victory Medal and the 1914-15 Star. Although his records state that he was demobilised to Levenside, Stokesley, research has failed to uncover any further information about Albert Fishwick in the North Riding of Yorkshire. However, there was a marriage in 1920 in Durham of an Albert Fishwick to a Margaret Joyce, and children to this marriage from 1920 to 1936 seem to include Walter and Dorcas (both born in Durham), George, Hannah and Kenneth (born in Stokesley) and Margaret (born in Middlesbrough). Some of the names and the births which occur in Stokesley seem to raise the possibility, but there is no concrete evidence to show that either the marriage or the children are definitely connected with the Stokesley man. Garrett FitzGibbon was born in Grangetown (Middlesbrough district) in 1888. He was the son of John FitzGibbon (from Monmouth in Wales) and his wife Eliza (from Staffordshire) and in the 1891 Census we find Garrett, his parents and Garrett's baby sister living in Grangetown, where John was recorded as a 'rail dresser' in the iron and steel works. Garrett gained a brother, John, later in that same year, but his mother Eliza died in 1893, perhaps in giving birth to her second daughter, named Eliza after her. John re-married in 1895, and his second wife was Johanna Coughlan (from Middlesbrough). In 1901, John, now a rail inspector, was still living in Grangetown with his wife Johanna, Garrett and Garrett's sisters, children of his John's first marriage. John FitzGibbon junior was a patient in the Church Lane Sanatorium in Eston. The FitzGibbon family remained in the Grangetown area and it was there that the young Eliza died in 1910 at only 16 years of age. By 1911, Garrett and his brother were also working in the steel industry; Garrett was working as a 'roll turner' and his brother as a rail dresser. The family was living in Roseberry Terrace. Our researches have not revealed when Garrett moved to Stokesley, but when he attested on 15th November 1915, in Middlesbrough, Garrett gave his name as 'Garry' and his address as Central Stores, Stokesley, Yorkshire. He was 26 years and 3 months old and single. His occupation was 'roll turner'. Garry joined the Royal Engineers as Sapper 131597. He was 5'5.5" tall and had a chest measurement of 41.5" and gave his religion as Roman Catholic. He gave his father as next of kin, but when he married Helena Lucy Stalker (of the Central Stores, Stokesley) in the Roman Catholic Church at Stokesley on 23rd September 1916 she became his next of kin. Helena's father, William, was the manager of the Central Stores in Stokesley High Street. We would like to place on record our thanks to Irene Ridley, the well-known and highly respected Stokesley historian and authoress, for telling us that this was a grocery shop next to what is now Barclay's Bank. This shop was demolished along with its neighbour the Bull and Dog Inn [later to become Hugill's fish shop] to make way for Hinton's supermarket. This is the present location of the Co-op mini-market. Garry was moved to Buxton early in 1916 and attached to 236th Army Troop Company where he was acknowledged as a fitter and turner and awarded the pay grade for his skills. On 27th January, 1916 he was appointed Lance Corporal (with pay) and four days became '2/Corporal'. A week later he was full corporal and embarked for France on 8th March. 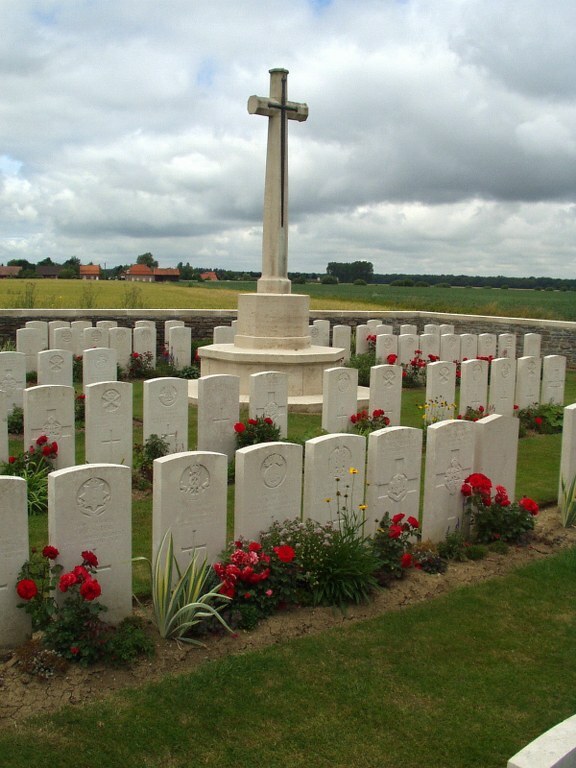 The following two years saw 2 of the bloodiest battles of the war, the Somme (1916) and Passchendaele(1917). Garry's unit fought in the Somme offensive, from which he emerged unscathed. In August 1917, following a test set by one of the personnel from the Malleable Works in Stockton, Garry's skill classification was upgraded from 'very good' to 'superior'. However, he was wounded on September 2nd 1917, and was away from his unit for more than a month. He re-joined on 17th October and was mentioned in despatches by Field Marshall Haig in November, 1917. He remained in France until 21st January 1918 when he returned to Britain, having sustained a fractured left femur whilst on duty in the previous month, and transferred to 3rd Reserve Battalion. Garry spent time in the Military Hospital in Leeds, from which he was discharged on October 11th, 1918. On 15th October, 1918, less than a month before the armistice, Corporal FitzGibbon was discharged from the forces with a character reference of 'very good', being no longer physically fit for duty as a soldier. He returned to Stokesley, and was later awarded a pension of 6 shillings a week for what was reckoned to be a 20% disablement. Corporal FitzGibbon was awarded the Victory Medal, the Silver War Badge and the Oak Leaf Emblem awarded to men mentioned in despatches. The last of these awards (made in 1923) was sent to an address in Gilkes Street, Middlesbrough. Without birth certificates we cannot be absolutely certain that they are the children of Garrett FitzGibbon and Helena Stalker, but it seems likely that there may be descendants of Garrett FitzGibbon still living within our locality. We would welcome any information that they might be able to supply to us. Garrett himself lived in the area until his death at the age of 70 in 1958. George Henry Foster was born in Stokesley on 8th February, 1894, and in 1901 he was in the Stokesley Workhouse with his mother Anne Foster and his brother Frederick. Ten years later, we find him listed in the census as a farm labourer, and living and working on the farm of Thomas Swinbank in South Moor, Sedgefield, Durham. His army records show that George was remarkably similar to his brother. He was 5’ 5” tall, with grey eyes, light brown hair and a fresh complexion. He weighed 135 lbs with a chest measurement of 37”. On enlistment, George said he was aged 20 years and 205 days and he gave his mother as next of kin. He became Private 5099 in the 1st Battalion, Durham Light Infantry. George was sent to France in December, 1914, arriving on 13th December, and thus qualifying as an Old Contemptible. Unlike Frederick, George survived the war and was discharged on 19th July 1919 at Woolwich dockyard. At this time his service number was 169060. He again said that his next of kin was his mother and gave his home address as White House Cottage, Beckside, Stokesley. George was awarded the 1914 Star, the British War Medal and the Victory Medal. George later married and seems to have ended his days in Hartlepool, as there is a death record for a George Henry Foster aged 75 in that town in 1969. John William Garbutt was born in 1891 in Chop Gate He was the son of William Garbutt, a farmer, and Annie, . In the 1901 Census, when he was 9, John was living in Apple Tree Hurst, Bilsdale Midcable, with his parents , a younger sister (Ruth), an uncle and a cousin. John's paternal grandparents were also in the house, John's grandfather being listed as a molecatcher! The family was still at the same address in 1911. Sister Ruth has left the parental home, but there is a younger sister, Hilda Emily (4). John was 19 and working on the farm. John attested 19th February 1916. He gave his age as 24 years and 3 months and said he was a farm labourer of High Ewe Cote, Chop Gate, Bilsdale, Stokesley. He gave his father as next of kin. He was placed in the 2nd Training Reserve Battalion. He spent the months from February 1916 to 26th April 1917 in the UK, when he was sent to France, arriving on the following day at the Base at Etaples for 31st Battalion, Northumberland Fusiliers. From there he was transferred to the 8th Battalion, Yorks and Lancs Regiment on 12th May as Private 32549. Just over three weeks later, on 7th June 1917 he was reported wounded and missing, and in consequence his mother was granted a separation allowance to run to the 18th February 1918. His body later buried in Plot II.J.18 at the quaintly named Perth (China Wall) Cemetery near the Menin Road. Private Garbutt's effects were ordered to be sent to his father, but the record later says there were no effects to send. Private Garbutt was officially listed as deceased on 18th April 1918. He was awarded the British War Medal and the Victory Medal and is commemorated on the War Memorial at Bilsdale Midcable. John Joseph Glentworth was born in 1894 at Grangetown in Middlesbrough District. He was the son of John Glentworth, an engine fitter of Eston and Amy Amelia Lamb of Jarrow, who had married in Rotherham in 1886. In the 1901 Census the family is shown at 13, Middlesbrough Road, South Bank, next door to the Alexandra Hotel. The head of the family was Amy Glentworth, John's mother 34 years old and married. John had three older sisters and one younger brother. The 1911 Census shows the family at Rushford House in Stokesley. Amy is again the head of the household, who declared that she had been married for 25 years and had given birth to 12 children of whom only 6 were still alive. Three of the children were with her, but again her husband was not listed. Presumably as an engine fitter John senior travelled a great deal in his work. John Joseph himself was at 'The Field', Nunthorpe, with his sister Lily and his brother -in -law William Laws. John Joseph was working as an apprentice bricklayer in the Steelworks. John attested on 1st September 1915 at Marton Hall, giving his age as 21 years and 5 months, his address as Rushford House, Stokesley and his trade as bricklayer. He appears to have joined 236th AT company, Royal Engineers on 1st November. His regimental number was 131574. John Joseph's medical record tells us that he was just over 5'7" tall, with a chest measurement of 38.5". Interestingly, he listed his father at Rushford House as his next of kin. Having been recognised as proficient in his trade, John was promoted from Sapper to Lance Corporal on 28th February, 1916. He was sent to France on 9th March 1916 and later appointed Acting 2nd Corporal, this appointment being confirmed on 24th April. On 16th June 1916, he was promoted to Corporal and on 18th June, having passed a higher proficiency test, he was granted an increase in rate of pay to 'one quarter engineer's pay'. John was mentioned in one of C in C Haig's Despatches (16th March 1919) which was printed in the London Gazette 7th July 1919. By this time, however, Corporal Glentworth had been demobbed - to Coatham, Redcar. Corporal Glentworth was awarded the British War Medal and the Victory Medal, but his records make no mention of an oak-leaf emblem - given to soldiers mentione in despatches. In 1924, John applied for a post with the Crown Agent for the Colonies, but at present we cannot say whether he was appointed or where the post might have been; whether or not he was appointed, it appears that John and Eva later moved to Humberside, where an Eva Glentworth died in 1940. There is a marriage record for a John J Wentworth in Hull in 1940, so it is possible that he re-married. Research has also revealed the death of a John J Glentworth in Hull in 1969. Alfred was the son of James Alfred Grabham, a Stokesley man, and Eliza Carrington of Normanby. James had a long connection with the army, first with the DLI and later with the Royal Garrison Regiment, and was a serving soldier when he married Eliza at Eston on April 18th 1892. By 1901, James had moved with his family (2 boys and 2 girls) to Staveley in Derbyshire, where he was a blast furnace man. However, James' health was deteriorating and he died in 1905; sadly for the young family, Eliza died too, in 1907, and so we find Alfred in Stokesley in the 1911 census, living with his sister Annie at their grandparents' house on Commercial Row. Alfred was then 16 years old and working as a gardener. William Herbert Grabham was born in 1883, the son of James Grabham a general labourer from Hutton Rudby and his wife Jane. It is possible that James’ surname has been wrongly transcribed on the official indexes of marriage, as they record a James “Gravins” marrying Jane Grainge in 1864 in Stokesley and we have found no record for James "Grabham” marrying any “Jane” at the appropriate time. However, the 1911 census shows James and Jane as having been married for 47 years (i.e. marrying in 1864), and lodging with them at that time was Alfred Grange aged 54. As the 1861 census shows Jane "Grange" with a younger brother, Alfred, the coincidences lead us to conclude that wife Jane was in fact Jane Grainge. William had 12 brothers and sisters altogether but by 1911 only 5 were still alive. William was recorded at that time as a 'leader' by occupation. William Herbert Grabham attested on 11th January 1916, at which time he was 32 years and 6 months old and described as 5’ 8 ¾ “ tall with a chest measurement of 37½ “. He had blue eyes and his occupation was leader. He was living with his parents at White House, Stokesley. He had previously served for 3 years with 4 Yorkshire Regiment Volunteers, the precursors of the Territorial Army. William was first of all placed in the army reserve but was mobilised on 18th May 1917 in 10 Battalion West Yorkshire Regiment, as Private 20875. His record shows that he also served in India and South Africa. He remained in the army well after the Armistice, but on 18th September 1919 he was sent to hospital 6 miles out of Manchester with trench fever. From there he went to hospital at Glossop and then to a convalescent home in Blackpool. Private Grabham was awarded the British War Medal and the Victory Medal. He was discharged from the army on 18th November 1919. James Grange was born in the June quarter of 1874 in Stokesley. His parents were James Grange, agricultural labourer, and Christiana Swales (both born in the town) who had married in Stokesley in 1858. James was one of a large family numbering 10 children in all. In 1881 James was 7 and living in West End Stokesley with six of his brothers and sisters. Ten years later, the family had moved to 17 Crossbeck Terrace, Eston, where James, 17, is recorded as an ironstone miner. The house also contained his parents, his mother's blind father (Frank Swales), 3 of James' brothers and a lodger! By 1901, James' parents had returned to Stokesley and were living in Wood's Yard, West End, but James himself was lodging at Bulmer's Row, Normanby, and was a brickyard labourer. Not long after the census was taken, James married Hannah Green (from Boosbeck) at the Eston Parish Church on 16th April 1901. In the 1911 census he and his wife were at 17 Crossbeck Terrace, where James had lived with his parents. James had returned to his old job as an ironstone miner, and the census tells us that the couple had had five children, of whom only three were still living: Matthias Ramsdale Grange (b.1905), Freda (b 1908) and Margery (b 1910). On 31st August, 1914 James joined the forces at Middlesbrough. He gave his age as 34 years (he was actually 37!) and his occupation as miner. 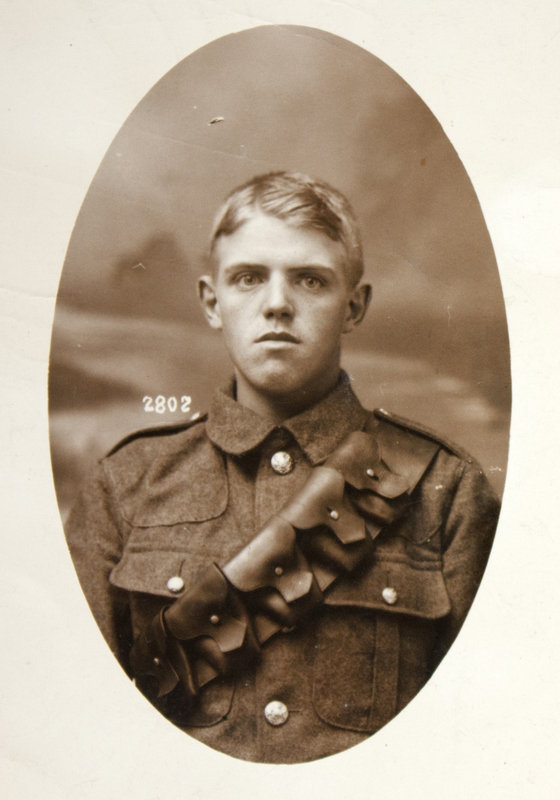 James became Pte 11857 in the Yorkshire Regiment and was posted to the 8th Battn Yorkshire Regiment on 8th September 1914. However, he was discharged on 31st October as being not likely to become an efficient soldier. His character was recorded as 'Very good'. This record also gives us the information that James and Hannah had had another daughter called Anna Eliza, born in February 1914. His medical record at attestation tells us that he was 5' 7" tall, weighed 138 lbs and had a full chest measurement of 36". He was of fair complexion with hazel eyes and fair hair. James, however, was determined to serve. He rejoined the forces on 18th January 1915, again in Middlesbrough. This time he gave his age as 34 years 9 months. He admitted previously being discharged as medically unfit, and underwent another medical. Having passed, he was given a new regimental number, 19927, and posted to the 12th (S) Battalion, Yorkshire Regiment (Teesside) on 17th February and then to the 14th Battn on 6th December 1915. During his service with the 14th, James was apparently temporarily released for employment. However, the record goes on to tell us that James was posted once more in February 1916, though the details of this posting are missing due to damage to the original document. James was transferred to Class W Reserve for employment with Messrs Bolckow and Vaughan on 5th June 1917. Alfred Horn Gundry was born in St Saviour district, London, Surrey in 1874. He was the son of Joseph Gundry, a waiter and his wife, Charlotte (maiden name Shrubsole Horn). He joined the army on 8th February 1893 aged 18years and 5 months. His occupation at that time was as a baker. He was living with his parents in St George’s Basin, London. He was 5’ 5 ½ “, weighed 119lbs with a chest of 35 ½ “. He had brown hair, blue eyes and a sallow complexion. He chose to join the Yorkshire Regiment and became Private 4035. Alfred initially joined at Jersey with the 2nd Battalion. He was appointed Lance Corporal in 1895 and extended his service with the colours to 12 years in August 1900. He was promoted to Corporal in 1898 but chose to revert to Private in 1900 whilst he had a trial with the Pay Corps. However he returned to the Colours and was re-promoted to Corporal in November 1900 and to Sergeant in November 1901. Alfred saw service in India (1895 - 98) and afterwards with the 1st Battalion in South Africa (1901 – 1902) for which he received a gratuity in 1903. In 1904, obviously happy with army life, he re-engaged for a term to complete 21 years’ service. 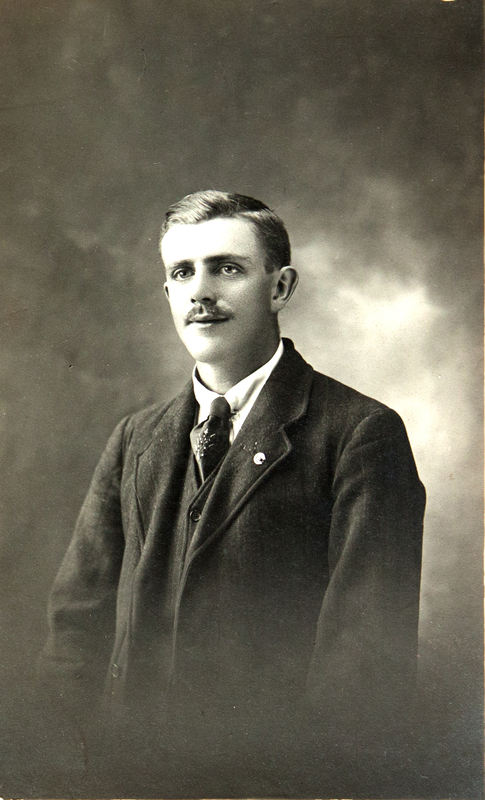 Alfred Gundry was promoted to Colour Sergeant in June 1913 with the 3rd Battalion with the regimental number 3/9643. CSM Gundry was discharged in July 1914 having given 3 months’ notice. The following month, World war 1 started! “This NCO is suitable for a position of trust”. He was also a “good man at accounts”. His character on discharge in 1914 was described as exemplary, reliable and trustworthy and his address was given as c/o Mrs Rowland, High Street, Stokesley. He received a pension of 2/3d per day for life. Warrant Officer Gundry's family clearly stayed in Stokesley after the war. Of his children May, Alfred, Harold and Aileen certainly married in Stokesley. Alfred Horn Gundry died in 1952 and his probate record shows his residence at time of death as The Bungalow, Meadowfield, Stokesley. Probate was granted to his wife and a solicitor’s managing clerk.